The SPAD XVI was a French designed and built fast two-seat reconnaissance type aircraft developed from the SPAD VII. Six of these were obtained by the American Expeditionary Force during the latter days of WW I and used in observation and command roles. At the time of its entry into service, it was one of the fastest and most manueverable two-seaters in combat. 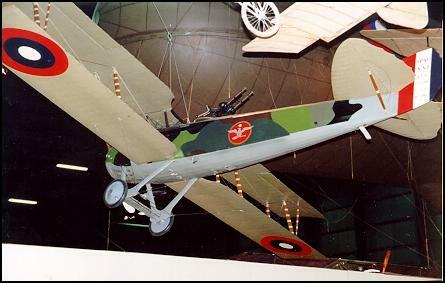 The aircraft on display was used as a personal plane by Brigadier General William "Billy" Mitchell who commanded the American Air Forces on the Western Front. While Mitchell often flew a single seat SPAD XIII, he used this aircraft when an observer or passenger was carried. The aircraft participated in the battle of Chateau Thierry, St. Mihiel and the Meuse-Argonne Offensive. In the latter battle it served as General Mitchell's forward observation platform and command vehicle. Span: 36 ft. 9 1/2 in. Height: 8 ft. 4 1/2 in. Weight: 1,917 lbs. empty; 2,844 lbs. loaded. Engine: One Lorraine-Deitrich of 236 hp.